Fight bits round 2 -What do you want? Fight Bits Round Two — What do you want? This seems like an easy enough question. One that many think that they know the answer to, in truth however it seems to be a little more elusive than it should. Many people join gyms or enrol inside a martial arts academy with a vague outlay as to what it is that they seek, at first it may be noble, to shed some flab, to learn some self defence or simply because they may want to overcome a deeper doubt and fear. The journey began with a destination in mind. As all should. Over time the destination however can seem a little more elusive, maybe it never was initially defined or you have gone down the wrong path. Perhaps you have strolled towards an empty mirage that only ever seemed to stay on the horizon. The flab was never enough, the more that one learned how to defend themselves the more they realised that they have no real idea. It can become overwhelming and causes one to give up or get uncomfortable with it all. So, some give up and walk away. Life is hard, good bye. Others that stick with it can sometimes find the comfort zone of training and may find a niche, whether it is martial arts or a place more akin to a sweaty social club where every one shares in the pretences of ability and combative skills, but its more about working out or collecting moves than it is about refining and sharpening any actual ability. It is often motion void of philosophy. It can even sometimes turn out to be a cult led by a just as deluded guru or a well meaning mentor who, despite their best intentions are as lost as you. The objectives can become material, a certificate or a belt. Suddenly a fun and mutual pyramid emerges that incentivises one to continue to train, techniques to memorise, maybe some patterns to duplicate and when the day of grading comes or should the attendance rate be high enough one can then be awarded the dyed fabric or a certificate that levels them up. It feels good to get awards. When asked how good one may be or what abilities one may possess they can say with earned confidence that they are such a colour belt or level x in the system. This is satisfying it is rewarding and their peers can boast by proxy sharing in this pride. It engenders a warm and glowing feeling. Whether this was the initial goal when one started inside a combat sport or martial art, no longer matters. Comfort has been found. Humans are attracted to formal hierarchies, such rankings allows them the desire to climb the status pyramid. The reasons for this are obvious to many. Inside real life, outside the institutions of civility organic hierarchies exist. They are based on ability and experience. Inside a fight gym one knows who is the better fighter or most skilled, they have observed or felt it. Inside nature beasts test one another out thus establishing dominance through aggression and ability. It is cruel and primal. Social media is a splendid thing, like any medium it is a tool to be utilised by the individual. Those from within their respective fetishes and industries all lurk inside the same domains, follow the same accounts and often share the same memes. The cognitive dissonance is reassuring, it confirms what they already know, what they are fond of having as a reinforcement. A generation earlier had video tapes and magazines, before that books and pamphlet. The only real change is that technology gives us greater access to so much more and yet many choose to exist on a train track of linear knowledge, forsaking all that is around. Train hard and you will be rewarded. Sweating is the body crying. Such an such martial are is superior because of this and so on. Quotations from icons are shared, often overlapped on an unrelated image that often can defy the very context of the quote. It does not matter though, from within the self absorbed capsule the gist of it all is known. Training is fun, the process is enjoyable and it is an escape from an other wise “stressful” world. It is motivating and inspiring. But motivating and inspiring to do what? To be what? The world where real predators lurk and many suffer beneath them, such motivational junk is borderline on being insolent. The existence of such a reality was after all why many began training in the first place, because they wanted to be fitter, faster and know the things that could make them capable at self defence or look so impressive that they would deter the demons in life. Training’s meaning however just changed and became more general and social over time, it became fun. That is fine. And if that is what you wanted, then all the more blessings to you. For those that seek or sought something different, perhaps a truth. Where is it? What happened? Is it found inside the generic? Can one find any truth in doctrines or from within the secure validation of accreditation? After all, do the predators really care what belt colour you are? Wanting to be a fighter is easy. The goal is simple. Wanting to be an athlete inside a specific field is also easy. You need to learn the craft of the sport and get really good and capable at it, testing yourself, living it especially for those that wish to become the elites. Those without such a simple objective it can be quite harder. After all, what is fitness and self defence? If not merely an abstract. For the fighter and athlete the objective may be easier but the journey is harder, it is riddled with trial, competition and the spectre of defeat. These individuals undergo so we may learn. The original reasons why one may have commenced training in something was built on an insecurity. Whether this was health, aesthetics or fear of violence. This insecurity and concern drove them to seek out a solution and the expert harbingers of a remedy. What happened? Did one solve the problem? Did you learn to walk around confident that you have found physical and spiritual peace? Can you destroy every other beast on this Earth? Or did the cause of those insecurities disappear? Or simply no longer matter. The reasons are as unique as all of us. So too should be the solutions. Doctrines and systematic factory training of one size fits all seldom allows for individual growth instead it works for some but fails many others. It also helps many fall into the comforting fold of conformity where they can hide inside the costume and flock of the setting. The insecurity seeming alien, the teachings and collective gathering nurturing and confirming. Unfortunately, life is tough, it is savage and those fearing violence were wise to do so. While its tragic touch may escape most of us, it does not mean it no longer exists. Fearing it obsessively is like any excess unhealthy but nodding to it respectfully is not. Training and questing answers, yearning to solve the physical puzzles of crisis is difficult and can only come from a place of insecurity. Not comfort and collective delusion. If you train and really do it for absent minded reasons then so be it. If you are one of the dying few that yearn to learn how to properly fight, for what ever reason. Often in a non sport setting then approach this journey with constant questions and insecure steps. Always assume that the others are better, always train as though you are inferior, they are always fitter, faster, stronger. Never let up on this concern, never grow comfortable or stale. Every underdog story inspires because it is about the weaker over coming the strong. They trained harder and to be better because knowledge of this inferiority drove them to be better to beat the bully or the best. It is why Rocky and the Karate Kid did so well. 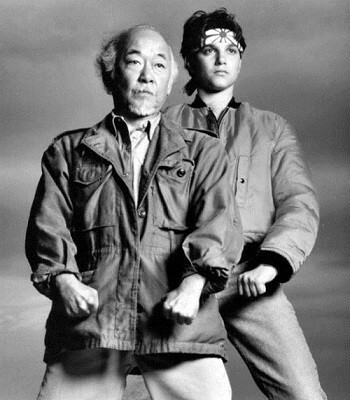 Daniel LaRusso was weak and in his mind the victim. He had something to prove, he practiced and learned diligently and his objective was clear, to win the All Valley Karate championship, to beat those that had wronged him on their chosen platform. Rocky Balboa an over the hill club fighter that had dropped beneath contender status long before his opening fight against Spider Rico, is given a once in a life time to face the best in the world. The Champion. He trained hard and practiced his craft and went the distance, he proved he was no longer a bum. Their arcs were pure. They were insecure and worked hard to remedy that. They knew what they wanted. This may not work for all, that is precisely the point and as mentioned above the goals you or others may have likely differs. But before you commence simply ask yourself, what it is that you want? Because without this simple question you will never find any answer instead you will meander and walk in circles only profiting charlatans that seek to sell you comforting deceptions and worse, those specters that lurk not only inside our frightened imaginations or memories but who lurk around a corner of unfortunate timing. The outcome of such a meeting will be defined by your answer to the question. Previous Post The left and the right really don’t matter. The wars do.